Sylvester Stallone lived in Philadelphia during his teenage years in the late 1950s. Born in 1946 in New York City, Stallone was raised in Washington D.C., until his parents divorced when he was nine. Stallone then lived with his mother in Center City and Lexington Park while he attended a number of schools in Philadelphia. Fourteen different high schools, including Notre Dame Academy and Lincoln High School, expelled Stallone due to his behavior. 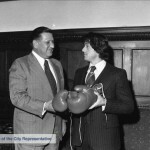 Finally, Stallone was sent to Devereux Manor High School, which specialized in helping students with behavior issues, and he graduated with a sports scholarship to the American College of Switzerland and traveled overseas. Acting became Stallone's primary aspiration while in college, where he excelled in a variety of school plays. Soon he attended the University of Miami to study drama; and in 1970 moved back to New York City to pursue an acting career. Prominent roles in large-budget films were difficult to come by, even after Stallone moved to California in 1974. Since his acting career was not going as planned, Stallone began to start writing movie scripts. He wrote Rocky during the winter of 1975, and he sold it to the film production company United Artists in January 1976. The financial success of Rocky allowed Stallone to pursue additional acting, writing, producing, and directing over his decades-long career. Although known typically for doing action movies, Stallone branched out into a variety of other genres, including comedy, science fiction, and children's films. Towering at over eight feet tall, the Rocky statue was created in 1980 after Sylvester Stallone commissioned sculptor A. Thomas Schomberg to create the work for a scene in Rocky III in which the City of Philadelphia presents the statue as a tribute to Rocky Balboa. 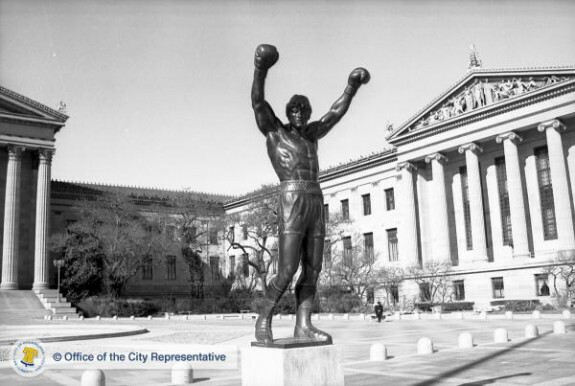 After filming Rocky III, Stallone donated the bronze statue to the city of Philadelphia, but the placement of the statue in front of the Philadelphia Museum of Art, as shown here in 1982, caused controversy. Some critics rejected the sculpture on the ground that it was not worthy of display at the museum, while supporters argued that embracing the statue would give deserved recognition to the Hollywood hit and generate valuable publicity and tourism for the city. Since the 1980s, the Rocky statue was primarily on view outside of the Spectrum arena in South Philadelphia, but it was moved around the city for events or for scenes in later Rocky films. In 2006, the statue was permanently installed just north of the base of "Rocky steps" at the Philadelphia Museum of Art. Philadelphia during the 1970s was far from the manufacturing powerhouse of the previous decades; declining economic conditions, political corruption, and an increase in crime in Philadelphia can be seen throughout the scenes of Rocky. The loss of industrial and manufacturing jobs after World War II had a negative impact on the local economy and members of the working class struggled to find whatever jobs they could to afford basic housing and food. Like Adrian and Paulie, many working class families faced overwhelming economic challenges, which often meant that multiple family members had to stay employed to afford their homes. 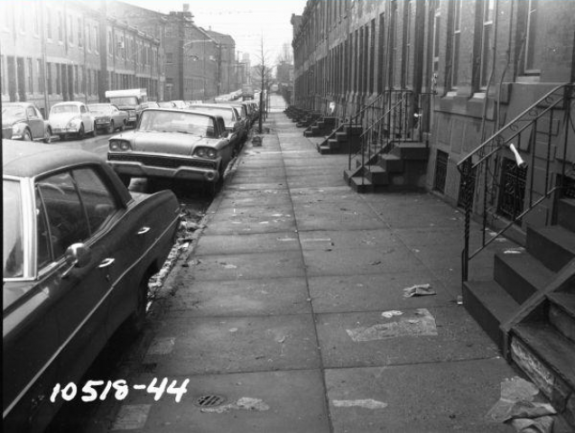 Row homes, like the ones pictured here on North Howard Street in 1971, were depicted unglamorously throughout Rocky, giving the audience a realistic sense of space within the walls of these homes. More than just a popular series of Hollywood films or the fictional prizefighter whose life and career they chronicle, Rocky is a late-twentieth-century cultural phenomenon that reframed Philadelphia for local, national, and international audiences. Rocky premiered in 1976. Written by and starring Sylvester Stallone (b. 1946), the film introduced audiences to Rocky Balboa: a down-and-out boxer and debt collector from Philadelphia who gained confidence as he trained to fight the reigning heavyweight champion. Although nearly everyone in Rocky’s world recognized that he was outmatched and expected him to lose badly, he held his own in a fight that lasted fifteen long rounds. Fictional heavyweight Rocky Balboa had analogues in several actual boxers who fought during the twentieth century. Balboa shared his first name with Rocky Marciano (1923-69), the undefeated heavyweight champion from the 1950s. Chuck Wepner (b. 1939), who famously endured fifteen rounds in a 1975 match against heavyweight champion Muhammad Ali (b. 1942), was later dubbed “the real Rocky.” Also like Rocky, Philadelphia-based heavyweight champion Joe Frazier (1944-2011) was hailed as a hardworking blue-collar counterpart to his great rival Ali in the early 1970s. Rocky, a low-budget production, won Academy Awards for Best Picture, Directing, and Film Editing. A franchise emerged. Rocky II (1979), Rocky III (1982), Rocky IV (1985), Rocky V (1990), and Rocky Balboa (2006) tracked the eponymous protagonist as he persevered in the face of professional and personal challenges. Primarily set in Philadelphia, with many scenes filmed around the city, Rocky and each subsequent installment in the series (except Rocky IV) offered viewers both an imagined and an actual image of Philadelphia. Local viewers could take pride in seeing their city on screen, while audiences elsewhere could survey Philadelphia as they watched Rocky run past the Navy Yard, along the Schuylkill River, through the Italian Market, and down the Benjamin Franklin Parkway. Other sites that appeared throughout the films, including Laurel Hill Cemetery, Rittenhouse Square, and Broad Street near City Hall, marked the setting as Philadelphia. Even the unglamorous row houses and shops in Rocky’s urban neighborhoods of Kensington and, later, South Philadelphia, represented the residential city. As the cityscape changed over the course of three decades of Rocky films, the movies documented that transformation. In addition to their role as a backdrop to the film, some sites, like the steps in front of the Philadelphia Museum of Art, actively contributed to Rocky’s story. 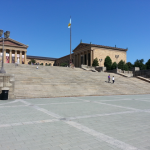 The climax of Rocky occurred during a training montage when Rocky triumphantly bolted up the seventy-two steps that lead from the Benjamin Franklin Parkway to the neoclassical façade of the Museum of Art. Rocky’s physical ascent demonstrated how his self-esteem had grown throughout the film. 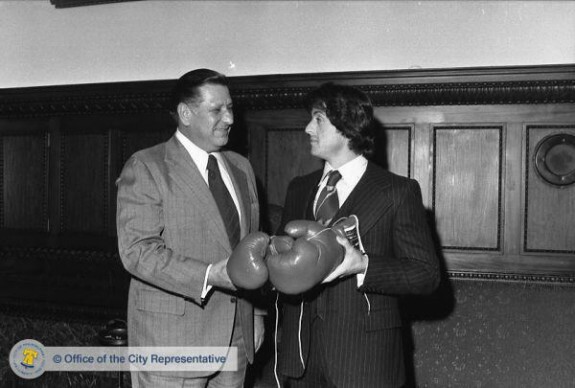 When he arrived at the top, he gazed out at the Philadelphia skyline; on his way to becoming a nationally recognized boxing star, Rocky appeared to hold the entire city in his vision. The scene’s symbolism depended, too, on the museum’s cultural significance. Rocky’s journey from working-class Kensington to a recognizable bastion of high culture foreshadowed the wealth and cultural clout that the boxer earned as his career progressed. The narrative of Rocky also overlaps with narratives about Philadelphia, its spirit, and its reputation. Rocky’s ability to beat the odds and transform from an average “bum from the neighborhood” into a nationally and internationally successful boxer corresponded to Philadelphia’s own arc during the late twentieth century. 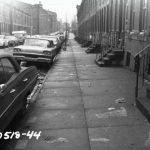 No longer the manufacturing power that it was decades earlier, and suffering from woes related to crime and political corruption, 1970s Philadelphia, like Rocky, was down and out. 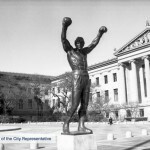 Rocky’s gritty perseverance became symbolic of the spirit of the city, suggesting that actual Philadelphians could similarly succeed in the face of seemingly overwhelming challenges. Nationally published newspaper articles and locally generated publicity materials promoted this belief. As policy changes, economic shifts, and tourism initiatives began to revive Philadelphia in the 1990s, the city demonstrated that, like Rocky, it could improve its condition and reassert its national and international significance. Rocky and Philadelphia developed a symbiotic relationship that blurred the lines between the world of the films and actual Philadelphia. Some critics expressed concern that the films’ version of Philadelphia framed the city through the eyes of a white working-class protagonist beginning at a time when racial tensions in the city ran particularly high. Even so, Rocky’s fictional experiences and the image of the city that grew out of the early films resonated across diverse audiences. 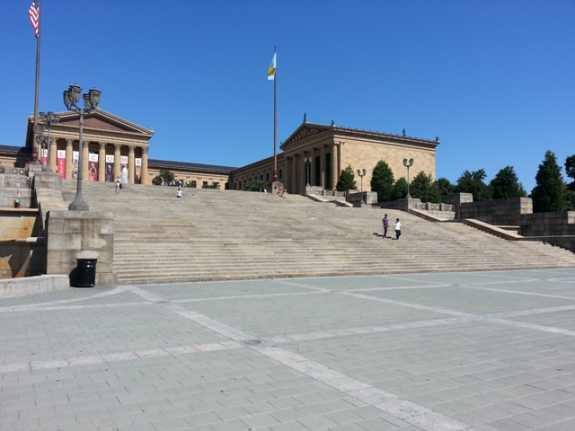 Running up the steps of the Museum of Art became a popular tourist activity and a recurring trope in each Rocky movie. By the 1990s, the museum’s steps acquired a widespread vernacular title, “the Rocky Steps.” In addition to reenacting the popular scene from the film, runners understood their behavior as a performance that allowed them to channel Rocky’s perseverance. In 1980, Stallone commissioned sculptor A. Thomas Schomberg (b. 1943) to create a bronze statue of Rocky. The 8-foot, six-inch piece appeared in Rocky III as the City of Philadelphia’s tribute to its by-then-famous hometown hero. Stallone donated the sculpture to the actual City of Philadelphia and proposed installing it in the same location where it appeared in the film. While critics rejected the sculpture on the ground that it was not worthy of display at the museum, supporters argued that embracing the statue would give deserved recognition to the Hollywood hit that generated valuable publicity and tourism for the city. The sculpture was moved several times over the next twenty-five years, but it spent much of that period on view outside the Spectrum arena in South Philadelphia. In 2006, the statue was permanently installed just north of the base of the Rocky Steps. There, it commemorates the character, the films, and their important reciprocal relationship with Philadelphia. Laura Holzman is Assistant Professor of Art History and Museum Studies at Indiana University-Purdue University Indianapolis. Holzman, Laura. “Re-placing the City Icon: Shaping Philadelphia’s Image for the 21st Century.” PhD diss., The University of California, Irvine, 2012. Rice, Danielle. “The ‘Rocky’ Dilemma: Museums, Monuments, and Popular Culture in the Postmodern Era.” In Critical Issues in Public Art: Content, Context, and Controversy, ed. Harriet F. Senie and Sally Webster. New York: HarperCollins, 1992. Simon, Roger D. and Brian Alnutt. “1982-2007: Toward the Postindustrial City.” The Pennsylvania Magazine of History and Biography 131, no 4 (October 2007). Stallone, Sylvester. The Official Rocky Scrapbook. New York: Grossed & Dunlap, 1977. Vitez, Michael and Tom Gralish. Rocky Stories. Philadelphia: Paul Dry Books, 2007. Rocky. Directed by John G. Avildsen. 1976. Rocky II. Directed by Sylvester Stallone. 1979. Rocky III. Directed by Sylvester Stallone. 1982. Rocky IV. Directed by Sylvester Stallone. 1985. Rocky V. Directed by John G. Avildsen. 1990. Rocky Balboa. Directed by Sylvester Stallone. 2006. The Real Rocky. Directed by Jeff Feuerzeig. 2011. Marketing and Public Relations, “Rocky” (box 54). Philadelphia Museum of Art, 2600 Benjamin Franklin Parkway, Philadelphia. Anne d’Harnoncourt Papers, “Rocky.” Philadelphia Museum of Art, 2600 Benjamin Franklin Parkway, Philadelphia. Urban Archives, Special Collections Research Center of Temple University Libraries, Samuel L. Paley Library, 1210 Polett Walk, Philadelphia. The Rocky Steps: Twenty-Sixth Street and the Benjamin Franklin Parkway (at the Philadelphia Museum of Art). Rocky (A. Thomas Schomberg, 1980): Twenty-Sixth Street and the Benjamin Franklin Parkway (just north of the base of The Rocky Steps). They are not the Rocky Steps! Only someone from Indiana would refer to the steps as such. It’s the Philadelphia Musuem of Art steps. The museum has a great history and houses great art. The out of proportion Rocky statue ( a fictional character) shouldn’t even be there.